Shiraz by Kay Brothers of McLaren Vale. A rich and round, soft and voluptuous, fruit driven Shiraz with a hint of confectionery sweetness in the background. Outstanding Langtons Classification. After decades of love and care, Block 6 has been redeveloped and nursed back to health. A very approachable full bodied combination of blueberries and plum, ribena and mocha chocolate, spice box, vanilla and pepper fill the palate with decadently delicious flavours. Five months later Bert and Fred carted in vine cuttings from Tintara; 25,800 Shiraz, 5,000 Riesling, 10,000 Carbenet, and began planting the fallow paddocks. There is a meticulously kept diary for every year that the Kay Family has been at Amery. They give not only detailed vintage records and weather information, but also a host of day-to-day insights into the tremendous physical effort people put into working and living in those early days. On Friday 15th July 1892 they recorded: "W.H. Craven offered to supply Carbenet and Malbec cuttings at 10/- per thousand." Tuesday 19th July "T. Hardy called - agreed to buy 900 white Hermitage vines from him." Wednesday 20th July - "Ordered from W.H. Craven at 7/- per thousand 14,500 Carbenet and 13,000 Malbec cuttings. J.G. Kelly called, agreed to take 3,000 Riesling cuttings." Monday 25th July - "Planted 457 White Hermitage on hilltop". Thursday 28th July - "T. Hardy sent up 90 White Hermitage vines (2 years old)." The first grape crush came in 1895. Today, the Heritage Listed Kay Brorthers Amery is the oldest McLaren Vale winery still in founding family hands. The Rieslings were the first true varietal wines grown to the area and some of the older traditional winemakers in the district were prophetic of failure. Time has happily proved to the contrary and today outstanding Riesling wines are still being made in McLaren Vale. The Riesling recorded in the 1891 diary were in fact, mainly the variety we now know as Chenin Blanc. The warm temperate climes, cool moist winters, warm dry summers and proximity to the sea ensures that frost, which is a debilitating agent in many viticultural areas, is virtually unknown. The vineyard receives a rainfall of approximately 550mm year and excellent vines are grown on a wide range of soils, the predominant being ironstone gravel. The estate Cellar Door, which is part of the original Winery complex, boasts some stunning panoramic views of the surrounding picturesque valleys and hillsides. The Kay Brothers were partners in business for fifty-seven years, which is a remarkable achievement in the Australian winemaking scene. Herbert Kay was made Chairman of the Australian Wine Board in 1933 where he sat for twelve years. Herbert's son Cuthbert (Cud) Kay took over the management and winemaking at Amery. He increased the vineyards, concentrating on more Cabernet Sauvignon, Shiraz and Riesling with some smaller areas of Sauvignon Blanc and White Frontignac. In the 1960s changes in the estate's primary UK market and uneconomic prices led to the development of Australian markets. 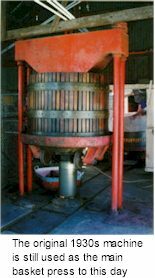 Initially this was in bulk to other winemakers but progressively more and more wine was packaged until eventually all of the output became branded under the Kays Amery Vineyards label. The Kay Brothers Winery today are specialist traditional red wine makers utilising grapes from their own 22-hectare Amery Vineyard and from the neighbouring Oliver's Taranga. The relatively small, strictly regional estate can boast an enviable record in wine shows around Australia and Internationally. The welcome at Cellar Door is as friendly as the view is seductive, so allow plenty of time during your visit to taste the renowned selection of wines and explore the Kay Family diaries dating from 1891. As Ernest Whitington wrote in 1903 "If any people engaged in the industry deserve success they are the Kay Brothers, who have been at Amery for twelve years. The property is situated on the Vale side of Tintara, and the view from the house is one of the finest in South Australia. Looking towards Tintara the valley and hillsides are literally covered in vines, and at the time of my visit the autumnal tints of the leaves enhanced the beauty of the scene. Encircling behind are wooded hills, and then away in the dreamy distance is a blue haze covered range. Turn around and you are gazing over vines and ploughed land away to the sea. You see Aldinga Bay quite plainly. When I go to Amery and the exquisite landscape, the labour which seems to be one of love, and the contentment that prevails ever recalls one verse from Gray's Elegy!"